Finally, it is done and all the footage from ‘BUYS’ is now online. I will try to organise a dedicated Matchbox channel over the summer holidays but in the meantime it is on my channel. The opening of Saturday’s show can be found clicking the link above and you will then be directed to corresponding links beneath if you click the ‘Show more’ tag. Feel free to subscribe to the channel if you are a regular YouTube user. The ‘Compleat Works’ and ‘All the Great Books’ will hopefully be published in the very near future. Following the publication of the Thursday night’s show, here is the first of a number of clips from the Saturday night. Unfortunately the whole show was not recorded and a large part of the first half was shot at the same distance and angle as the previous recording, though at better quality. I was, however, able to record a lot of the second half from the sound desk and resultantly could get much closer to the action. Now, it isn’t perfect by a long shot- there are some jarring zooms and movements which, hopefully, will be cut when the refined version is finished, and, much as I tried, it was difficult holding things steady, the problems of lacking a tripod, and up close and personal those handheld shots seem altogether more shakey. However, this footage does offer a more intimate take on the proceedings and does away with some of the problems from the Thursday night white outs. Well just over a week has passed: the lights are taken down, the hall is cleared up, the set stowed away and our celebration of Shakespeare’s 450th anniversary and 95th production has well and truly come to an end. That is not to say we are done with it here. Photos and a review are inbound for the very near future but, in the meantime, please find attached a link to the recording of the Thursday night’s performance. It is, I’ll be the first to say, rough around the edges at the mo and a lot of the time looks like it’s a Slender Man outing on the Titanic (And for those of you not wholly savvy with your internet memes and urban legends it means that it’s at an angle with a lot of moments when lights obscure faces.) but I hope to replace it with a more polished version from the Saturday performance. At the very least it’s my hope to get a few scenes from that night online. 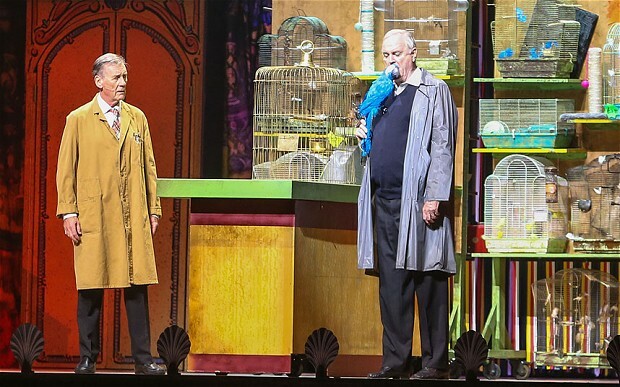 In the meantime, I hope that you enjoy a flavour of the show, and if nowt else it brings back a few choice moments from what was a splendid production. Take care, keep well and I will be back mighty soon with pics and a few collected thoughts in review. Well, it was universally agreed that the opening night of our ‘Brush Up Your Shakespeare’ was a success with many satisfied customers. The mixture of food, drink, chit chat, history, comedy and tragedy certainly hit the right note. Amongst many whispered observations the words ‘Excellent’; ‘Very funny’; ‘A brilliant night’; ‘That was one of the best things they’ve ever done,’ and ‘Hasn’t he got lovely legs!’ were picked up by my shell likes. You can judge all these things for yourselves if you are coming this evening or tomorrow, including the legs – the owner of which I leave you to identify! And if not, there are still a handful of tickets available for tomorrow and one has become available tonight so don’t miss out. As a fan of the troupe, as anyone who has seen any of the Matchbox Sized Shakespeare Company ™ works can testify, it proved an interesting read. But also as an actor who, every night before performance, frets about that terrible moment when the mind goes blank and just how one is going to get through a night of remembering so many words, it provided another layer of interest. I took a prompt last week as a medieval king of England. It was my first for fourteen years, the last being in ‘Travels with my Aunt’ whilst drawing out my interrogative Colonel Hakeem. I was devastated as I reeled across stage and tried to regain my composure but eventually got back on with the job. Damn the fellow in the front row reading his programme as I came on! But really, was it a bad thing? The play carried on and no one even noticed. In fact it turned out to be one of the better nights. Moving through my forties now with the brain cells beginning to wink out like stars at the end of time I suspect there will be a few more prompts in the offing before I hang up my hose. It is a slight worry but at the end of the day, there is no thrill like being out there and delivering the lines when it is going right and no horror like being mid scene and forgetting what comes next. It takes a special sort to get up there and do it that’s for sure. We, therefore, hope our audiences will be given more than ample delight during their two hour or so stay on our ‘isle’. Time will tell but I have a good feeling about this one. That’s it then, show time. I will keep my next little dose of nostalgia in check for a few days until it’s curtain down and hopefully be back with a postscript after the weekend. in the meantime take care all and I hope to see you sometime over the next three days. Well, the week is finally upon us and it’s time to for you, the audience, to ‘Brush up Your Shakespeare’. Yes, the curtain goes up this Thursday, Friday and Saturday on the Matchbox’s summer offering, our revue of all things Bardic in honour of the great man’s 450th birthday. Cabaret-style, it is set to be a more informal evening of eating, drinking and merriment with audiences entertained by a series of sketches, songs, extracts and surprises all seamlessly held together by our very own manifestation of Bill Shakespeare himself. Throughout the evening punters will witness a host of classics presented in ways familiar and some in ways wholly unexpected, with a finely crafted balance of the more thoughtful and dramatic and a very healthy dose of the comic and, in some cases, deliciously absurd. This has been a labour of love for cast and crew – and not a labour lost- and it is pleasing to see that we are approaching another sell-out, although there are a handful of seats available at time of writing if you haven’t already booked your seat for this unique experience. The product of a great many minds with all manner of directorial touches and flourishes, when this many cooks are involved in such a spicy, eclectic broth, it is important that a head chef comes to the fore. Though not necessarily applying for the job, Vicky Pearce has taken on the role with aplomb to pull together a marvellous evening of theatre which will see a magnificent array of turns from Matchbox faces old and new. We sincerely hope to see many of you there on the night, this will be a one of a kind event and we would hate you to miss out. Hopefully there will be an update from the dress rehearsal before curtain up and there is also a little cheeky nostalgia lurking in the wings to get you in the mood (I will publish that very shortly) but in the meantime keep well, take care and give me now leave, to leave thee.